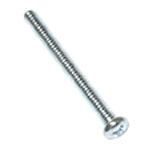 #6-32 x 3-inch (77mm) Phillips-head screw for playfield posts. Often stripped, broken, or bent on most games. Grab a few for valuable spares! Used for 3-tier flipper return lane guides on games like Star Wars, Getaway and similar.